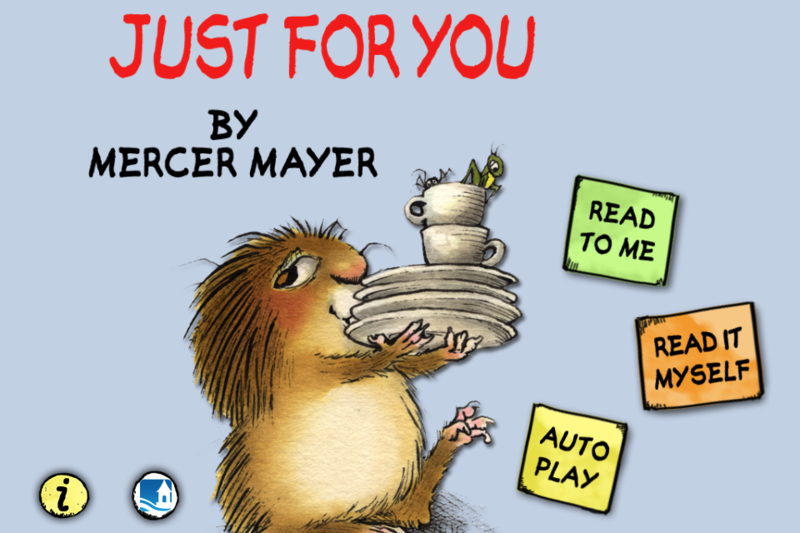 Just for You by Mercer Mayer is the first book in the Little Critter series, published in print in 1975. It is a beloved story about Little Critter as he tries to help his mom. Most of his attempts are way beyond his abilities, though, leaving mom to help clean up after he 'helps'. Little Critter may not always do things perfectly, but he does his best! This digital version adds a new twist, having the reader try to find all the cute spiders (15 in all) and grasshoppers (15 in all) hidden on every page. When the child taps on one of the two bugs, a chime sounds; at the end of the book, a page is displayed with the number of bugs (of the total) successfully found. This little extra was a big hit with my kid and made re-reading a bit more fun. As a parent, I liked this interactivity because it rewarded my child for paying attention, although it did distract from the story on the first reading. Like other omBooks by Oceanhouse Media, this app is interactive in a way that enhances early reading skills. Most images (of mom, sister, dad, Little Critter and many items in each scene), will name themselves aloud while the word briefly appears over the illustration. For example, touch a mouse and the word "mouse" appears and is spoken aloud by the narrator. If the word is also present in the text on that page, it highlights as spoken, providing nice auditory/visual word-reinforcement for young learners. For early readers and pre-readers, the text also highlights as the narrator says each word. By the way, the young voice-actor is also easy to understand. I particularly liked the choice of child narration in the Little Critter book apps, since the story is told in the first-person. Overall, this is a cute book and a great read for children six and under. Recommended! Little Critter wants to do something special for his mom ... just for her. But with the best of intentions, he seems to make more of a mess, even though his very patient mother seems please at his efforts. He tries to make breakfast but the eggs slide off the plate onto floor, for instance. And when he tries to 'clean up' he usually just makes a huge mess that Mom needs to clean up after. Sometimes he gets it just right, though. Like when he gives his mom a goodnight kiss.